Use our informative map of Israel to help you plan your special visit to The Holy Land. Israel lies along the geographical coordinates of 31° 30′ N latitude and 34° 45′ E longitude. 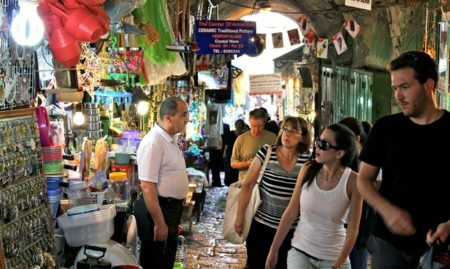 Although Israel is relatively a tiny country, you will see on the Israel map that the country has a unique varied topography from snow-covered mountains in the north to desserts and red mountains in the south edged by The Mediterranean and Red Seas. Israel shares its numerous borders with Lebanon, Egypt, Syria, Jordan, the Gaza Strip and the West Bank. The Pilgrimage Map outlines the landmarks and attractions that religious pilgrims will not want to miss on their trip to Israel. The map will guide you to the most fascinating religious, historic and archaeological sites throughout the country, and will ensure an unforgettable spiritual experience. As you can see, the map features all significant sites in Jerusalem and the Old City such as the Church of the Holy Sepulcher, the Garden Tomb and Dormition Abbey. Remember to check out the Jerusalem maps available on our site. How to use: Right click on the PDFs below and download for free to your computer.